Jackie Ohh… Named finalist for the Event Planner of the Year! I AM SO HAPPY TO ANNOUNCE THAT I AM A FINALIST FOR THE SECOND YEAR IN A ROW FOR THE EVENT SOLUTIONS SPOTLIGHT AWARD FOR THE 2010 EVENT PLANNER OF THE YEAR AWARD. Now that the judges have made their choices of narrowing down over 500 nominees to a hand-full it is up to the public to vote for the winner. I am asking for your vote! It’s easy and it will take a few seconds to complete. Then, enter your e-mail address, and click vote. Please also vote for our friends, The Biltmore Hotel for Event Site of the Year, CircX for Entertainment Ensemble of the Year, and Room Service for Rental Company of the Year. Click Submit on the bottom of the page (partial ballots are allowed). I will be traveling to Las Vegas in March for the Event Solutions Spotlight Awards Gala. Thank you again, from the bottom of my heart, Thank YOU. Jackie Ohh… Named The Knot’s Best of the Best 2010! On Friday, I got an e-mail from the Knot Inc. announcing that Bride’s chose Jackie Ohh… Events as The Best of The Best Wedding Coordinators in South Florida. It’s such a great honor to have been chosen. Thank you to all you brides who voted for Jackie Ohh… Events. The Knot magazine will be releasing their Best of the Best lists in the Spring/Summer magazine in news stands December 26th! More great news came in today! I opened my emails to find out I was nominated for another category as well, Rising Star Female. I am super excited!!!!!!!!!!!! I am even more elated to share the news with you all. For those who nominated me, thank you from the bottom of my heart. All of the continued support means the world to me! Thank you Thank you Thank you. I am SO happy to announce that I got an email this evening notifying me that for the 2nd year in a row, I have been nominated for the Event-Solutions Spotlight Award for Event Planner of the Year 2010. I was in Vegas this past February for the Spotlight Awards and it was a memorable experience. All of the candidates will go through a comprehensive evaluation in hopes of becoming a finalist. If I am as fortunate as I was last year and I am chosen as a finalist again, the voting is up to YOU. I will be sure to post all of the updates. What a week! I got back from Vegas last Thursday… it was such an amazing experience! Over 500 people gathered together on Wednesday at DreamWorks Studios in Vegas for the Event Solutions Spotlight Awards and Catersource CATIE Awards. It was truly a surreal feeling to be together with the Best of Best in Event/Wedding Professionals. There were over 35 categories of awards, some of the finalist for other awards came from Miami! It was great seeing them there. Congratulations to all of the finalists and to the winners. It is a great honor to have been selected for such prestigious awards. Howdy Ya’ll! I am in gorgeous Las Vegas for the Event Solutions Conference and the Spotlight Awards Gala this evening. I am so excited to be here with my amazingly loving and supportive husband and family. We are all so excited for the Gala this evening. Thank you to all who voted for me, I am forever grateful for your continued support. All of your e-mails the last couple of days are so thoughtful and very much appreciated. I will keep everyone informed of the Awards this evening. Vote Jackie Ohh… Event Planner of the Year! EVENT PLANNER OF THE YEAR! 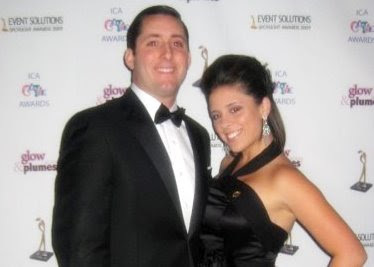 and Vote for Jackie Ohh… Events – Event Planner of the Year/East Coast. I thank you ALL in advance for your votes. I truly appreciate your continued love and support. for the National Conference and Black Tie Awards Gala. Jackie Ohh… FINALIST for the 2009 Event Planner of the Year Award! I am soooooooo EXCITED to be blogging the latest news! About an hour ago I found out that I am a finalist for Event Planner of the Year!!!!!!!!!!!!!!!!!! I’m going to VEGAS!!!!!!! A couple of months back I was notified that my peers had nominated me for the 2009 Event-Solutions Event Planner of the Year Award. I was overwhelmed with excitement (which is not even close to how excited I am right now!). I had to submit a couple of essays, biography, pictures, and letters of recommendations etc. in order to fulfill the submission process for judging; it took me about 2 months to complete, but it was all worth it! I just found out that the judges chose me as one of the finalists for this prestigious award! Public online voting begins mid November and we go to Vegas in February to the Event-Solutions Conference. The awards gala is on the last night and we’ll find out the winners there! To all of the vendors who nominated me and all of those who support me, thank you so much. I am so blessed to have an enormous group of vendors that I am associated with. You ALL mean the world to me. The last couple of months have been so amazing. You ALL have supported me so much; I truly apprecaite it and always remember everything you have done for me. To my family and friends– Who have to deal with me day in and day out, which I know is difficult with the nature of my business. From the time I wanted to become a planner (and everyone thought I was crazy) to where I am today, you have ALL stood by me in the best and worst times. I can never thank you enough. Mom and Dad- you are my heroes and my role models. I wouldn’t be here if it wasn’t for you and your love and support. Thank you. AND To my husband, you are a true angel. I don’t know how you put up with the craziness of my work. I love you so much for that and much more. You are amazing, my backbone and my strength. ALL of YOU make ME a better planner and a better person. This award is not for me, it’s for ALL of us! I have the great honor to be nominated for Event Planner of the Year! The news was a complete surprise to me, I was floored when I got the e-mail. I had to read it over a dozen times before it really sunk in! I am overwhelmed with excitement. Words cannot express how amazing it is to be nominated for this prestigious award. Fellow event and wedding professionals are the ones who nominated me … Thank you to all of you who support and believe in me and my passion and love for my profession. I am very much looking forward to the months ahead and the awards convention in Vegas! Wish me luck!